About a million people have listened to internet repeats of sci-fi comedy The Hitchhiker's Guide to the Galaxy over the past six weeks, the BBC has said. A third series of the show began on BBC Radio 4 in September, 26 years after the original show was first broadcast. It is based on an adaptation of Douglas Adams' third Hitchhiker book Life, the Universe and Everything. BBC director of radio Jenny Abramsky told a seminar that the figures vindicated the BBC's web investments. "We are completely amazed by the impact of Hitchhiker's Guide to the Galaxy," she told MediaGuardian.co.uk. "It's important to listeners. We have to continue making these kind of programmes to make people go to the web." Ms Abramsky was speaking at a Department for Culture, Media and Sport charter review seminar on Thursday. The Guardian said the show had proved more popular on the internet than The Archers or the Today programme, with one episode getting twice as many listeners online as The Archers. The show can then be accessed for seven days on the Radio 4 website after it is broadcast on Tuesdays and repeated on Thursdays. Since 21 September, about a million people have listened again to the five episodes broadcast so far, with Tuesday's sixth and final instalment going online after Thursday's radio repeat. 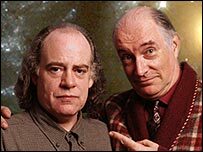 Douglas Adams recorded the part of Agrajag before his death in May 2001. His voice sits alongside those of original cast members Simon Jones and Stephen Moore. 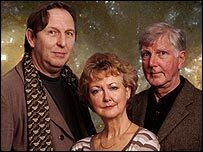 Jones, who plays befuddled hero Arthur Dent, and Moore, the voice of Marvin the Paranoid Android, are joined by Mark Wing-Davey (Zaphod Beeblebrox), Susan Sheridan (Trillian) and Geoffrey McGivern (Ford Prefect). With the death of Peter Jones in 2000, the voice of the book is now supplied by his friend, William Franklyn. Other cast members include Joanna Lumley, Richard Griffiths and Leslie Phillips. A forthcoming film version based on the first book will feature Bill Nighy and Martin Freeman.